The Grand Canyon International Hostel, in Flagstaff Arizona, is the closest hostel to one of the Seven Wonders of the World; the amazing Grand Canyon!! 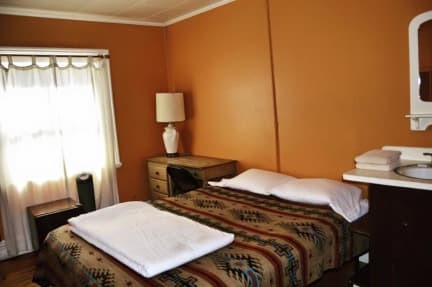 It is located one block from the Amtrak Station and 6 blocks from the Greyhound Station (we offer free pickup and drop off service between 7 am and 11:30 pm daily). This fabulous hostel offers first class backpacker accommodation and has been recognized by the Lets Go guide as one of their top picks for many years in a row. The clean and cozy atmosphere, and super friendly staff make it one of the best hostels around; it feels like a home away from home! 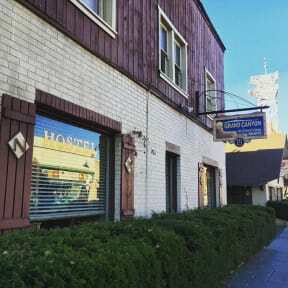 The hostel is centrally located in a charming, historic building in quaint downtown Flagstaff, surrounded by pubs, shopping and nightlife. Its south western decor, wood floors and unique artwork make this hostel a one of a kind. A TV lounge is open 24 hours, a FREE healthy breakfast is served daily and free coffee and tea are always available. Laundry facilities, high speed internet access, parking and free Wifi are also included. The Grand Canyon hostel has both dormitory and private rooms (private rooms need to be booked directly with the hostel). The dorms accommodate four persons and the private rooms have one queen bed. There is a sink and refrigerator in every room and mixed dorms are available upon request. The hostel also offers awesome day hiking tours to the Grand Canyon. You will enjoy a full day of breathtaking views, hiking and sightseeing with friendly and knowledgeable guides. These tours are definitely the best deal going - you won't find a cheaper price with any other tour company - guaranteed! We hope you will be our guest sometime soon!